Assam State Co-operative Housing Federation Ltd.
Assam State Co-operative Housing Federation Ltd. requires the following staffs on purely temporary basis. How to apply: Interested candidates may come with his/her original certificates for appearing in the Walk-in-Interview at HOUSEFED office, 4th Floor, West End Building, Housefed Complex, Dispur, Guwahati-781006 on 17th February, 2019 at 10 am. 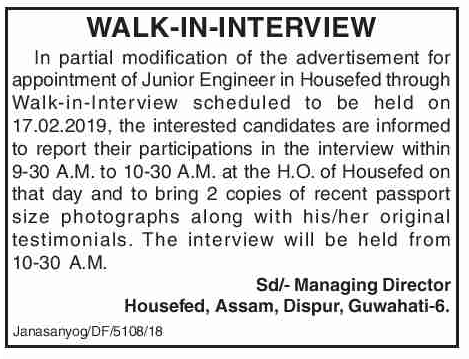 Update: In partial modification of the advertisement for appointment of Junior Engineer in Housefed through Walk-in-Interview scheduled to be held on 17.02.2019, the interested candidates are informed to report their participation in the interview within 9-30 A.M. to 10-30 A.M. at the H.O. of Housefed on that day and to bring 2 copies of recent passport size photographs along with his/her original testimonials. The interview will be held from 10-30 A.M.